This post has already been read 1341 times! KEARNEY – Brian Alber uses the word tradition when describing the University of Nebraska at Kearney bands. That tradition, he said, was established by a long line of dedicated directors and is carried on each year by a group of talented students representing the school. It will be on display 7:30 p.m. Saturday (Dec. 1) during a unique event in the UNK Fine Arts Building Recital Hall. The UNK Wind Ensemble will perform a special concert celebrating the 25th anniversary of the Kappa Kappa Psi and Tau Beta Sigma honorary band fraternity and sorority at UNK, featuring the premiere of a piece the Tau Beta Sigma chapter commissioned for the occasion. 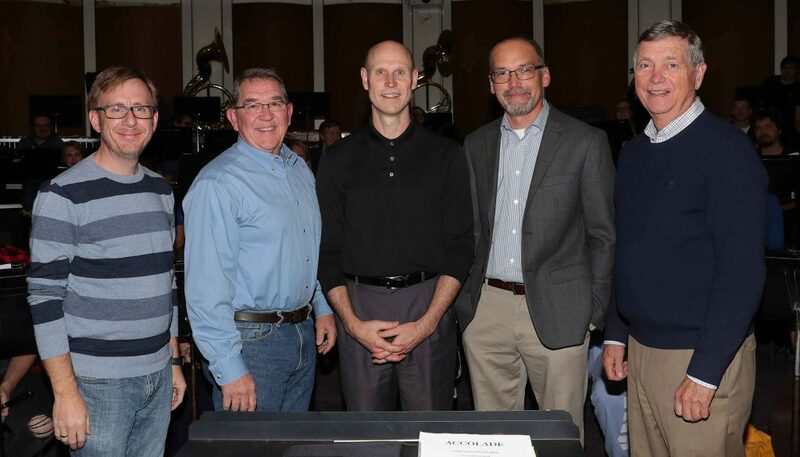 “Any time you get a chance to premiere a piece of music, it’s a special opportunity, especially when that world premiere is combined with an event that’s so important to our band program here at UNK,” said Alber, a UNK alumnus and the university’s assistant director of bands. 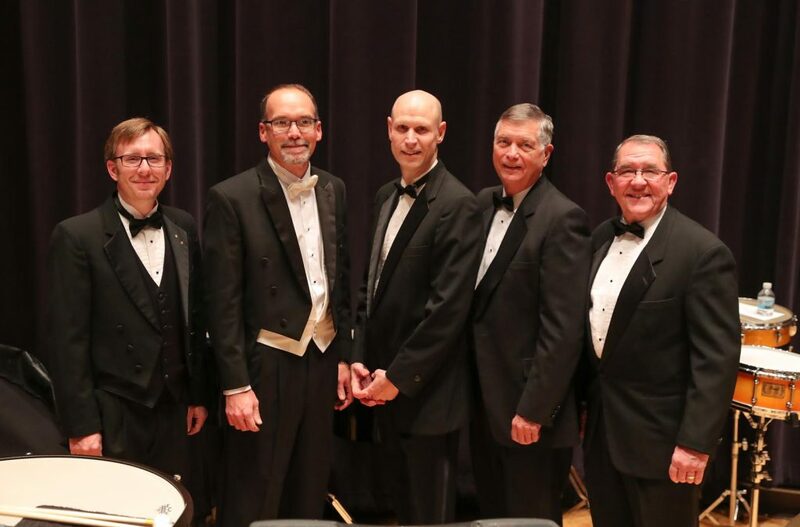 Saturday’s concert, which is free and open to the public, also brings together five current and former UNK band directors whose service covers 50-plus years. Duane Bierman, the director of bands since 2010, will be joined by guest conductors Ron Crocker, Gary Davis and Neal Schnoor, as well as Alber. Davis called the event an incredible opportunity. “It’s very unusual to have this many years of band directors who can even speak to each other, let alone be pleasant and musically accepting. Many times egos get in people’s way, and that’s just never been a problem here,” said Davis, who was UNK’s director of bands from 1990 to 2004 and helped start the Kappa Kappa Psi and Tau Beta Sigma chapters. Davis, who also served as director of UNK’s Honors Program from 2003 until his retirement in 2011, was lured to UNK by Crocker after six years at Wayne State College. “I’d known Ron for years, and Ron and I had always talked about working together,” said Davis, who was director of bands at Wayne State while Schnoor, a drum captain, and his wife Teresa, a drum major, attended the college in northeast Nebraska. The connections get crazier from there. Crocker joined UNK as assistant director of bands in 1966 and was later named director of bands, a position he held for 20 years before transitioning to associate dean of the College of Fine Arts and Humanities in 1989. He was also a department chair and theatre director during his nearly 50-year career at UNK, and he directed the Kearney Symphony Orchestra for 13 years. The best part, he added, is that he was able to continue teaching the entire time. “I enjoyed administration, but being able to work with students was the frosting on the cake,” he said. Schnoor arrived at UNK in 1997 as associate director of bands, working alongside Davis, and he was an associate professor in the departments of teacher education and music and performing arts through a joint appointment, as well as coordinator of K-12 and secondary education. He valued the leadership Kappa Kappa Psi and Tau Beta Sigma members demonstrated and their impact on the band program. “They worked behind the scenes and did all the things most of the other band members just thought sort of happened,” he said. Schnoor, the former band director at Kearney High School, left UNK in 2010 for a dean position at Wayne State but returned two years later in his current role as senior advisor to the chancellor for executive affairs. “We’ve always loved Kearney,” said Schnoor, whose wife Teresa, a principal at Central Elementary School, remained here during his time at Wayne State. Alber, in his seventh year at UNK, has witnessed firsthand the impact each of the other three guest conductors had on their students. Schnoor was a student teacher at Lincoln East High School while Alber was a sophomore there, Davis was his band director at UNK and Crocker was still teaching here when Alber was an undergraduate student. “They’ve had a huge influence on me as a band director and they’re incredible resources to have around, not only for me, but for our students, as well,” he said. Alber, who co-directs UNK’s Pride of the Plains Marching Band and directs the Symphonic Band, is equally excited about this weekend’s concert. “It’s an opportunity for us to share music, and I think that’s the most valuable experience students get here at UNK,” he said. Davis, another former president of the Nebraska Music Education Association and Nebraska State Bandmasters Association, is still active with UNK as a recruiter and he continues to judge high school music competitions across the Midwest. He’s also a member of the Kearney Symphony Orchestra, Crane River Theater and Kearney Concert Association boards of directors. On Saturday, he’ll conduct “Accolade,” which Schnoor commissioned as his retirement gift in 2011. It was written by close friend Timothy Mahr, director of bands at St. Olaf College in Minnesota. The UNK Wind Ensemble will perform 7:30 p.m. Saturday (Dec. 1) in the Fine Arts Building Recital Hall. The concert includes the premiere of “Apotheosis,” a piece commissioned by UNK’s Tau Beta Sigma chapter. It was composed by Kathryn Salfelder, a lecturer at the Massachusetts Institute of Technology (MIT) whose music has been performed by the Minnesota Orchestra, Albany (New York) Symphony, Yale Philharmonia, New England Philharmonic, Boston Musica Viva, United States Air Force Band and Dallas Wind Symphony. A special presentation on the history of the UNK bands is scheduled for 3 p.m. Saturday in the Fine Arts Building Room 264. Both events are free and open to the public.